If you’ve been following my blog for any length of time, then you’re aware that I made a huge life change in March of 2016. The change being, I left my partner of five years, packed my son and I up and moved from Sarasota, FL (AKA home and where I had lived for nine years before this move) to Atlanta. Needless to say, road trips were in order when the holidays came. And where there’s a road trip back home, there’s two things, Kia and a blog post on things to do in Florida (it would be rude not to). We began our road trip with frost and ended it with palm trees. So, I put together this list of all my favorite things to do in Florida, specifically the greater Tampa / Sarasota areas. Lucky for us Kia hooked us up with the 2017 Sorento EX for the ride! And for three adults, a child and one dog. Wouldn’t you know, it was the perfect size. Leaving Florida was bittersweet. I was in pursuit of something bigger for my career and ultimately seeking affordability as a single mom. Truth be told, Florida is a beautiful state. And my hometown in Sarasota is of the state’s loveliest cities with its crystalline shores, shopping and yummy eats. From Sarasota to Tampa, there are some really great spots to enjoy. On a budget? Check out my article on free and next to free spots to enjoy. This is and always will be one of my favorite spots to get an early breakfast. There’s something about Florida in the morning. It’s damp, cool and teeming with wildlife. New Pass Bait and Tackle is a small little local favorite perched on an inlet along the coast of Sarasota. Drive up or boat up, either way, it’s an awesome spot to grab breakfast, lunch and brews while you watch the pelicans and other wildlife. It’s been there for fifty plus years for a reason! Owned by my good friends, Full Belly Stuffed Burgers is the only burger joint you’ll ever want in your life. Another local favorite, this small restaurant makes amazing burgers stuffed with all your favorite burger fixins. They serve local and craft beers and are pet-friendly. I’ve never seen another Goodwill Bookstore. So whenever I am home I always make it a point to stop in and browse their vintage books. I’ve found most all my collectible vintage fairy tales and other works right in this bookstore. It’s also a great place to get other second-hand books at a super huge discount. Marina Jacks is an awesome place to check out in Downtown Sarasota. You can sightsee the yachts against the Sarasota skyline on one side while walking your pup along the Sarasota Bay on the other. Or, just grab a spot under one of the incredible Banyan trees and take in the scenery of anchored sailboats along the coast. There’s also a tiki bar and a free playground (water park in the warm months). Sitting at the bottom of the Sarasota overpass is Bird Key Park which happens to be the best place to catch an incredible sunset. You can jog, skate, walk your dog or ride your bike under the overpass then enjoy a lovely sunset. And if kayaking and canoeing is your thing, you can let in here too. Still my number one favorite beach along Florida’s west coast, Pass-a-Grille sits over the breathtaking Sunshine Skyway and at the furthest point of St. Pete Beach. It’s a historic little town with dining, lodging and shopping. In my opinion, it’s a way better spot than Siesta Key since you can walk right up to Paradise Grill and get you a margarita! If you grab a spot on Pass-a-Grille then do it near Paradise Grill. There’s no better convenience than being able to barefoot your way over to food and drinks. On the weekends they also have live music and art vendors. In the same area as Pass-a-Grille you’ll find Fort Desoto. If you’re into history and old creepy places, this spot is worth checking out in the cooler months. If you love the flavors of the Mediterranean, you must try Acropolis Greek Taverna. This is one of those places where every single thing on the menu is amazing. They offer everything from appetizers to main courses and even hookah. My recommendation is to try their signature salad and their taramosalata. If you’re in the Tampa Bay area and want to catch a sunset (rather than sit in traffic), head over to Cyprus Point. It’s a small little beach right next to the airport where you can watch the city go by on two of Tampa’s major bridges while watching planes take off into the sunset. Kids love this little spot because what kid doesn’t love watching planes take off!? I’ve never seen anything quite like the University Town Center during the holidays. Countless palm trees lit up in Christmas lights line the streets along with holiday landscaping and cheer from one side to the other. It’s seriously one of the things I miss about Florida during the holidays. Plus, the mall itself is high-end and boasts a variety of dining options and shopping. Some might say it’s a bit posh, but I just adore those lights! It was so nice to revisit all these favorite places of mine and especially since it was a first for my partner. He loved all the food and the local spots and I loved hitting all the spots in my favorite ride. Work on your laptop! Charge your DS! Kia is my first love. Florida is my home. I couldn’t think of any other way to spend seven hours in a car with my family than in a Kia Sorento. 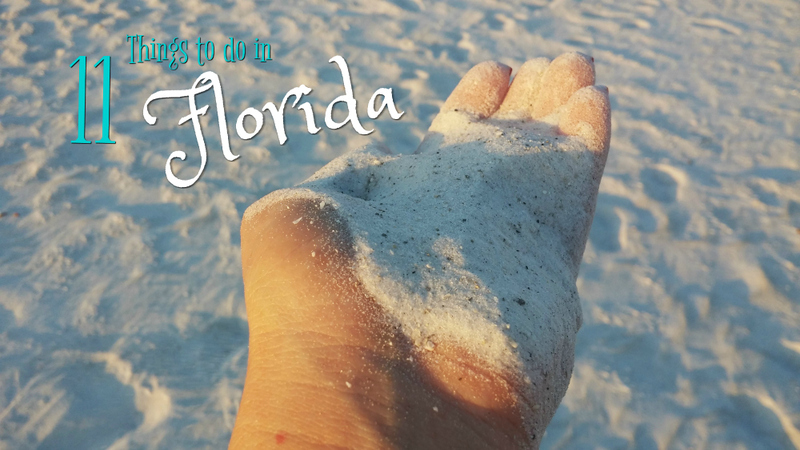 If you have anything to add to this list of things to do in Florida, please comment in the comment section below. Coming soon, my Kia Nero experience! Coming soon, my Kia Nero experience! Special thanks to Kia Motors for sponsoring this trip with the 2017 Kia Sorento EX. This in no way shaped my opinion of this car. I truly love the Kia brand.